Becoming a Servant of God – Connection! Are you able to prayerfully submit to the plans and purposes of God today rather than insisting on your own? Merciful Father, I’m tired of striving to do things for You instead of doing them “with” You. I’m sure I have followed many rabbit trails in my quest to serve Your kingdom when I should have been watching faithfully to see Your work all around me. Help me to humble myself and look for Your activity instead of seeking to go my own way. Please give me the heart of a servant. 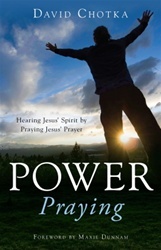 –Adapted from Power Praying (Hearing Jesus’ Spirit by Praying Jesus’ Prayer) by David Chotka. This book is available at prayershop.org. Use the code CONPSP3 at checkout to receive an additional 10% discount. Praise God that birth and conception are miraculous and a special gift from God. Thank him for planning all your days before you were even born (Ps. 139:16). Confess any dissatisfaction over the gifts and abilities God has given you. Commit yourself to God daily and, like Paul, be content in whatever situation he has placed you (Phil. 4:11). Ask God to bring personal peace as a member of your family. Pray that children in your family circle and among your friends may be blessed with godly parents who are good examples and who discipline them in love (Prov. 22:6). Harvest Prayer Ministries exists to equip the local church to become a House of Prayer for all nations, releasing God’s power for revival and finishing the task of world evangelization. We do this through consulting, teaching, developing resources, discipling, networking, and partnering. As you explore our website, you will see the many ways Harvest seeks to encourage churches and believers to deepen their connection with Jesus Christ through prayer. Previous PostPrevious Our Eyes are On You!